Chromatography Solvents Market has accounted for USD 101.7 billion in 2016 and is expected to reach USD 205.1 billion by 2024 at 9.2% by 2024. 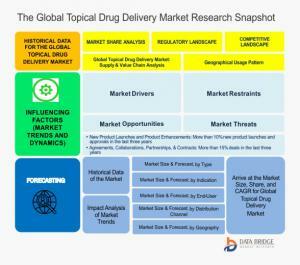 The global topical drug delivery market is segmented on the basis of product type, indication, distribution channel, end user and geography. Based on geography the market is segmented into 5 geographical regions, North America, Europe, Asia-Pacific, South America and rest of the world. The geographical regions are further segmented into 24 major countries such as U.S. Canada, Mexico, Germany, France, U.K., Belgium, Switzerland, Turkey, Japan, China, Singapore, Brazil, India, Russia, South Africa and many others. 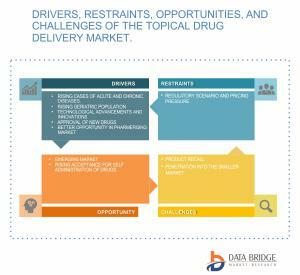 Some of the major factors driving the topical drug delivery market are ability to deliver drug at the desired site, inter-and intra-patient variations, without fluctuations in drug levels, an enhanced suitability for self-medication and improved compliance. Also, increasing aging population, growing prevalence of skin related ailments and rising prevalence of chronic diseases, also new and better technologies for topical drug delivery is expected to boost the growth of this market are the major factors driving the growth of the injectable drug delivery market. The major players in the topical drug delivery prescription drugs are Galderma Pharma, S.A., Allergen Plc. Kaken Pharmaceuticals, Co., Ltd, Pfizer, Bayer AG, 3M, Hisamitsu Pharmaceuticals, Co., Inc., Abbvie, Inc., Valeant Pharmaceuticals, Antares Pharma among others. 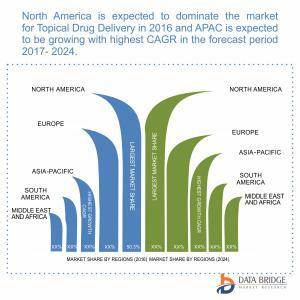 Some of the other players in the global topical drug delivery market are MedPharm, Janssen Pharmaceuticals, Inc. (A J&J Company), Crescita Therapeutics, West Pharmaceutical Services, Biofarmitalia s.r.l, Pharmatek Laboratories, Inc., Stiefel Laboratories, Inc., Tapemark, Acrux Limited, Nitto Denko Corporation, Skinvisible Pharmaceuticals, Inc., Mylan Pharmaceuticals Inc., Pocono Coated Products LLC, TheraSolve NV., Samyang Biopharmaceuticals Corporation, Lohmann Therapie-Systeme AG, Prosollus Pharmaceuticals, Easton Pharmaceuticals Inc., Novosis AG, Endo Pharmaceuticals Inc., Transdermal Technologies, Inc., Sheffield Pharmaceuticals, Inc., and Solvay among others. Galderma Pharma S.A. was incorporated in 1981, as a joint between Nestle and L’Oreal. Founded in 1863 and headquartered in Leverkusen, Germany, Bayer AG is a provider of healthcare, nutrition, and high-technology materials and services. Founded in 1994 and headquartered in Quebec, Canada, Valeant Pharmaceuticals International, Inc. is a pharmaceutical company which engages in developing, manufacturing, and marketing pharmaceutical products in the areas of dermatology, eye health, neurology, and generics. 11.10. VALEANT PHARMACEUTICALS INTERNATIONAL, INC.
11.12. HISAMITSU PHARMACEUTICAL CO., INC.
Data Bridge Market Research Private Ltd.